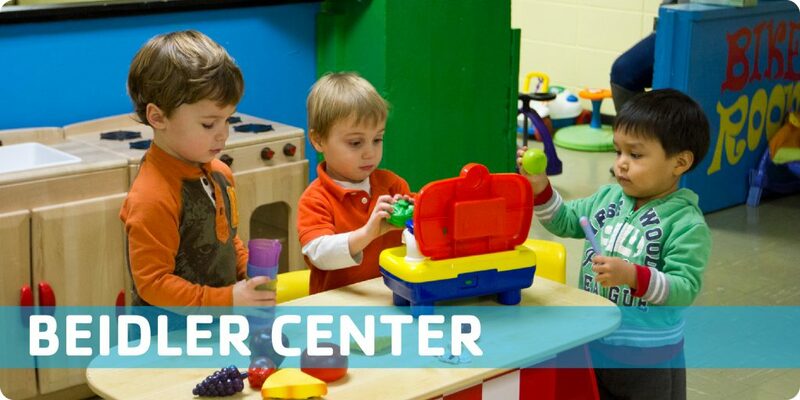 For parents who need a chance to rejuvenate and reconnect at the Y but don’t have child care, we offer babysitting services in our toy- and activity-filled Beidler Babysitting Center. Located on the lower level of our 1000 Grove location, the center is a supervised playroom for children 6 weeks through 5th grade. You’ll know your kids are safe and having a great time with other children while you get the opportunity to take that class or go for a swim on your own. Click here to read more about Beidler Babysitting Center policies. Two hours of babysitting per day, free of charge, is included with your family membership. For Beidler Center Hours & Holidays, please visit our Maps & Hours page. Members are required to have a member ID for the drop off center. The member that signs the child in is responsibile for picking up the child. If someone else will be picking up the child, please list the pickup person and they will have to have a government issued ID at the time of pick up. Parents are required to stat in the building at ALL TIMES. Pagers are available. If child is an infant pagers are required. If lost there is a $15 replacement fee. The Beidler Center is available on a first come first served basis. Our center has a capacity of 30 children. If we are at capacity, we will ask your family to wait for a spot to open up. There is no food allowed in the center. We will be happy to change your child’s diaper. We ask that you please provide diapers and wipes for your child. If your child is potty training, we ask that you take your child to the bathroom when they arrive and put their name on the potty board. Please bring an extra pair of clothes. We ask that everyone remove their shoes before entering the center. All jackets and shoes are to be put outside of the center. We have coat hooks and trays for shoes. Please let the Beidler Center staff know if there are any comforting accommodations that will help your child while they are in our care. If your child is exhibiting behavior that may hurt others (Children/Staff), we will require you to come and remove your child for that day. For the safety of all the children and staff, we ask that you do not bring your child in sick. Children need to be fever-free for 24 hours before they come back to the center. If we feel that your child is ill, we will ask you to remove your child from the center.